My new way to get pizza ideas is the check menu’s from pizza places. Eric enjoys Sgambati’s Pizza. I text him the menu to see if there was any one in particular he recommended for our Pizza Friday. He suggested Cheese Lover’s, BBQ Chicken and Gyro. I ended up making the Gyro and Cheese Lovers (without the feta). (How do you like my fancy pizza cutter? Gotta love my job!) Here is how I whipped up these Simple and Delicious pizzas!! 3. Turn the chicken pieces and continue to fry for 4-5 minutes. Fry until browned. (I have grilled the chicken on a skewer also.) The chicken tastes great grilled and fried. So pick your way and go from there! You need about 4 -5 ounces of the marinated cooked chicken for the pizza. This evening we had the makings for gyros too. 2 Tablespoons olive oil with 1 clove minced garlic. Mix together. I brushed the top of pizza with the olive oil/garlic mix. Added chopped onion, diced tomato and mozzarella cheese (you could add feta too), then the marinated cooked chicken. Baked at 475 degrees for 12 minutes. Sunday = comfort food = meat loaf. 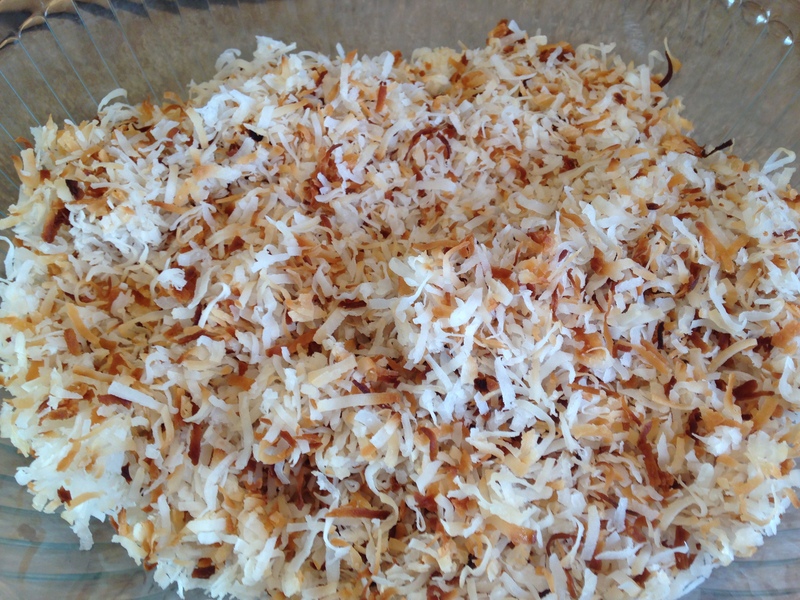 This is a recipe I have used for years. 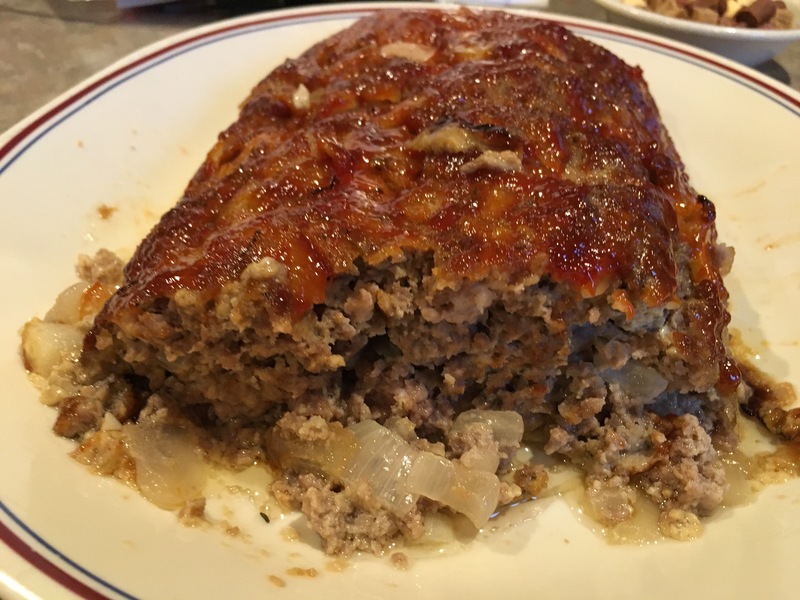 Every time I make this meatloaf it disappears way too fast. Most of the time there is not enough left over for sandwiches the next day. YIKES!! This time I managed to get a couple of sandwiches for Kent’s lunch this week. 1. For the glaze; Mix all ingredients in small saucepan. Heat through on low heat until brown sugar dissolves, set aside. 2. For the meat loaf; Heat oven to 350 degrees. I make a free form meatloaf. I do not use a loaf pan. I use a baking pan lined with foil with a baking rack. I place the meatloaf on top of a baking rack. This allows the fat to go into the pan and not all over the meatloaf. They also have perforated meatloaf pans but I don’t have one of those. Thus, I use the free form method. 🙂 You could wrap the meatloaf in bacon if you desire. I prefer not. 3. Heat oil in medium skillet. Add onion and garlic; saute until softened, about 5 minutes. Set aside to cool while preparing remaining ingredients. 5. Place formed meatloaf on top of the baking rack (or in your meatloaf pan. That is up to you.) and place in oven. Brush with 1/4 of the glaze. Bake for 45 minutes. Top again with 1/4 of the glaze. Continue to bake until second coat has set and loaf registers 160 degrees, about 15 minutes longer. Take out of oven and cool 10-15 minutes. (If the hungry crew allows!) Slice and serve with a extra glaze passed separately. Big hit in this house. Hope you give it a try and ENJOY!! Whisk all ingredients together. Refrigerate at least a couple of hours if possible. The flavors will blend well together. Everyone loved this too. Nice kick to it! Spotted this simple recipe in my Food Network Magazine. I thought it would make a great Sunday dessert. We all loved this one. Enjoy!! Line a 13×9 inch baking dish with foil, leaving a 2 inch overhang on two sides. Coat the foil with cooking spray. Preheat the oven to 350 degrees. In stand up mixer beat cream cheese and sugar until smooth. Beat in 2 eggs, sour cream and vanilla. Spread filling over completely cooled crust. Swirl warmed strawberry jam into batter. Bake until the edges are set but the center is still loose, about 30 minutes. Let cool, then chill in refrigerator to set. That’s it. Another Simple and Delicious dessert! !